1. Uwe is No 1 choice it seems. He is currently working with a DoF, gave a recent interview stating the necessity of one at English clubs and failed at Latics partly because of the absence of one. 2. Matt Jackson left the club after his period of “consultancy”. He seemed to have been at least involved with aspects of the club which would fall under the remit of a DoF. His post has not been filled. 3. 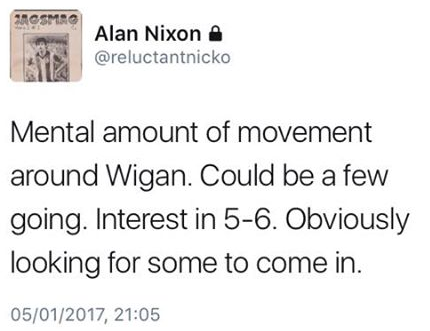 Going back several weeks to the now infamous tweet from the Radio Manchester journalist who said Latics fans would be “amazed” at what he’d heard (and which Paul Kendrick has said the two of them are still working on as story), I think this heralds the likely incoming of someone either well-known to us e.g. Uwe or the appointment of a big football name as a DoF. Add this supposition to your very valid arguments and I think there will be a big change at Latics this close-season and not just in the manager’s office. Difficult to make out there what he meant. He also said he didn’t want to stay if he was going to be sidelined (as clearly happened under Coyle, Mackay and Joyce) or words to that effect. Heard a rumor a few weeks back that David Moss from Celtic was being lined up for this role. I had not heard that one. I have thought this for a while, with the close relationship between Martinez and Whelan, both wanting to improve home grown talent or bring in young talent and product them the Wigan way. That seemed to stop when Martinez went. We have gone back three or four steps now to just buying in players. We need to hear a 1, 3 & 5 year plan. I like the idea of a DoF he can look at loan deals with the manager as when Morsy was loaned out to Barnsley, it was not because the player wasn’t good enough. He came back, played most of the games and the earned a new contract. We do need more consistently in the management and director positions. Sharpe is only very young he might love his football, but you can’t tell me he knows the business side of things. I’d agree with you on virtually every point there Gary. We need to move away from the idea that if a successful manager moves on, half the infrastructure of the club goes with him. In our case, under Roberto, that was made even worse because the transfer strategy was kept in his head. ← Latics go down with spirit, but do they need more shooting practice?